Teaching Kids About Money: Would You Pretend to Be Poor? I heard of a family the other day that had fooled their kids for years about their true financial situation. They had actually inherited quite a bit of wealth, but they didn’t want their kids to grow up being “spoiled.” The kids did not go to very expensive colleges. They wore clothes like everyone else. They did not take lavish vacations. It wasn’t until the kids were grown that they found out Mom and Dad had plenty of money. It got me thinking. John D. Rockefeller and Rose Kennedy ran their households that way. They ate beans and wore hand-me-down clothes. At some point the message was given to the grown kids: “To whom much is given, much is expected.” Many charities benefited from that attitude. These families are controversial in other aspects, but this way of raising kids is interesting to me. If you were a billionaire, would you let your kids know? I will never be in that category or even near it, but it raises an interesting question. 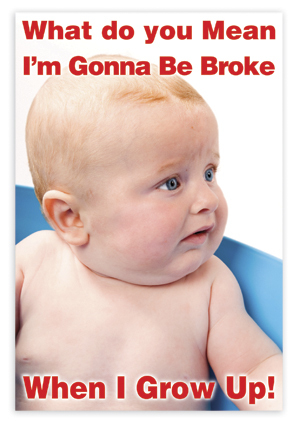 Even at your current financial situation, would it be good to hold back on some spending? Would it be good to give your kids the idea that money was not plentiful? With our kids we didn’t have to pretend. We had a moderate income, but with four kids, it was challenging enough. For our first born, I bought used baby clothes (the horror!). I figured the baby would grow through the clothes quickly anyway and I was glad to have a good supply. It also showed me which brands hold up better than others. And when an item got stained, it was not a big deal. Later I bought baby clothes from ebay, getting brands that I knew would last well. All of these got passed down to the next baby. When our kids were in high school I bought them new clothes, but mainly basics that would cover all their needs. If they wanted more than that, they could earn the money for them. Our boys didn’t care, but our daughter made sure she had jobs to finance her “wants” beyond the “needs” we had provided. To this day she says that was an important lesson for her: that if you want something you have to work for it. When our youngest went off to college, he bought a picture frame that cost $15. I told him to take it back and get one for about $3 instead. Later when I started to give him the talk about not spending too much money in college, he stopped me. He said the picture frame told him all he needed to know! I don’t claim to be the perfect parent, not by any means. But our kids did not go out in the world with an attitude that they would automatically become rich. They are fairly successful in several ways, not the least of which is their loving families. I feel that we did something right giving them a realistic grounding financially. They are not uber wealthy, but they do give to charity. I’m proud of them in many ways. Think about what kind of example you are giving your kids. Are you teaching them that it’s important to keep up with the Joneses? Are you running up debt? Do you require your kids to do chores? Do you give an allowance? Do you encourage your kids to save money? With the economy being uncertain, I think it’s even more important to teach the kids about money. Also, if we demonstrate too lavish a lifestyle, will they feel like failures if they can’t replicate that lifestyle? There are definite advantages to raising our kids with an attitude that we are careful with money. It’s a gift you can give your kids that will serve them well all their lives. Click here for how I taught our daughter about credit cards. She still tells me that it was an important lesson. How to you talk to your kids about money? Would you give them “the gift of poverty” even if you are not poor? I can totally see him doing that. I’ll look up those videos. Thanks, moneycone! There are few youtube videos on Warren Buffet’s life and his kids talk on how it was growing up… they apparently didn’t know how special their dad was!